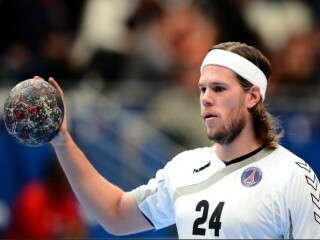 Mikkel Hansen is a young Danish handball player, which is currently playing in Paris. Mikkel was named IHF World Player of the Year as a reward for his 2011 performances. He joined FC Barcelona in June 2008. He previously played for Danish Handball League club GOG Svendborg, with whom he won the Danish championship in 2007. On 2 June 2010 he returned to Denmark, to play for AG København, after 2 years of playing in Spain. Mikkel Hansen is also European Champion with the Danish national team, winning the 2012 title in Serbia. He was also selected into the All-Star team of the tournament as the best left back. In 2011 he was a part of the Danish team that finished second in the World Championships in Sweden. He was the tournament's overall top goal scorer. View the full website biography of Mikkel Hansen.